We often get mired down in what we think we “should” do and what others expect us to do. In all the rules and regulations that we make up for ourselves, and others make up for us. Life is full of people who tell us how we “should” act, feel and be. How much of your day is spent doing things that you feel like you have to do? How many of those things are truly essential to your life? We can build an inner resentment when we continually do things that we do not really want to do, but feel expected to do. 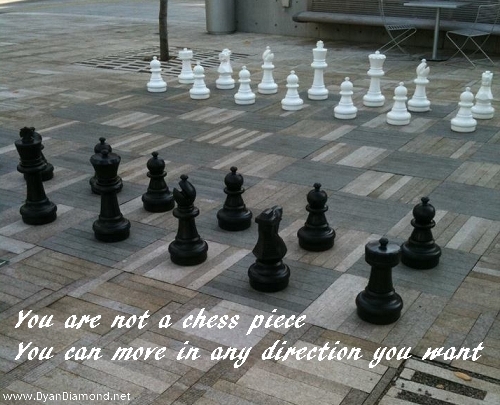 You are not a chess piece. You can decide what you want and how you want to get it. You can decide how you want to live. Your life is not a chess board. You can move in any direction you like. Any direction that moves you and speaks to your heart. Understanding this is personal freedom. Following your heart, rather than blindly stepping onto the next square on the game board, will bring you inner peace. Next Post Not Ready To Let Go?